The quintessential image of Italy might be all 1950s glamorous gelato and bikini-strewn lakeside bathing, impossibly hot days and ice cold birra as the sun slowly sets, but come the cooler months of the year, sometimes there’s nothing better than cosying up in front of an enormous fire in a one-time castle that is now a five star hotel. 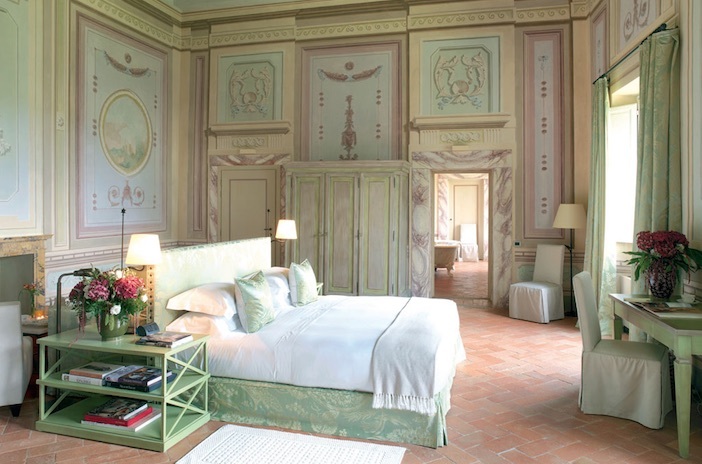 Once a family house owned by the noble Del Nero and Torrigiani families in the pretty Tuscan village of Tavarnelle Val di Pesa, stays here are now redolent with regal premise thanks to an extensive property-wide refurbishment, changing it into a hotel with imposing terracotta angles, dating back 900 years. Reached easily from Pisa international airport by driving along scenery-fuelled bitumen, Castello del Nero is set on a hilltop that offers extensive views over pretty valleys below, walkways richly sewn with vines and olive trees, and those altogether Tuscan, dark green and statuesque, cypress trees. Bedrooms at the castle number only 50, and are very much loyal to the region in essence, with some of the larger (18) suites boasting original 18th century frescoes, and one of the most palatial hotel bathrooms I have ever seen. The Royal Suite boasts an extensive balcony opening up onto a sky brim-filled with stars – the open countryside location ensures wonderfully minimal light pollution. ‘Standard’ rooms might boast four-poster beds with some of the softest Egyptian cotton sheets you’ll likely ever sleep in, plus a pillow menu for those particularly focused on the perfect night’s sleep. Specially sourced toiletries in grandiose bathrooms impart specifically Tuscan scents. There are no tea or coffee making facilities in the room I am staying in, but takeaway coffee cups are available in the breakfast room, should you be requiring of another dose of caffeine before embarking on your day’s chosen activities. Our own pursuits while staying here involve making our way to the stunning, nearby hilltop village of Badia a Passignano, to meet Jacopo – resident truffle hunter, and his two truffle hunting dogs ‘Pia’ and ‘Uffo’ (as in Tart’uffo – or truffle). We make our way into the surrounding valley’s woods where the dogs cleverly hunt out nuggets of black and white gold, often buried deep beneath the ground. Jacopo carries these pungent tubers in his pockets as we continue in our four-legged friendly foraging. With gun shots in the background sounding out other nearby “caccatori’ – (hunters), the smart reputation of this part of Italy is further personified in the Porsche SUV we see driving past us, realising soon that it belongs to the owner of Ristoro L’Antica Scuderia, who hosts us for lunch shortly after finishing our own approach to hunting. On the menu, of course, are a wide variety of truffle dishes, seasonality prevailing, and the atmosphere, dining undercover in the marquee adjoining the main building (quite the Italian thing), is convivial – we witness two old friends bump into each other in this tiny village, each in the company of their own extended families. Back at the hotel, we unwind after our ‘hard day’s work’ at the spa. This is Italy’s largest Espa – offering speedy treatments to full blown day-long pampering sessions, including some popular pre-natal offerings. Tropical showers, and a delightfully warm sauna on a chillier day than most, large steam room and alfresco vitality pool with powerful spurty equipment, pummel all possible tensions away. 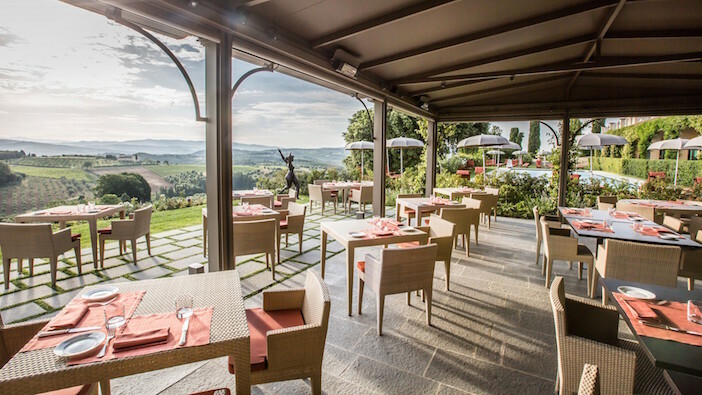 Dining at Castello del Nero is both fortifying and moreish across each of the three in-house restaurants – La Taverna is located outside within a heated or air-conditioned permanent tent, subject to outdoor temperatures. Although Executive chef, Giovanni Lucca di Pirro, is originally from the town of Forlí in Emilia-Romagna, his cooking here is authentically Tuscan. 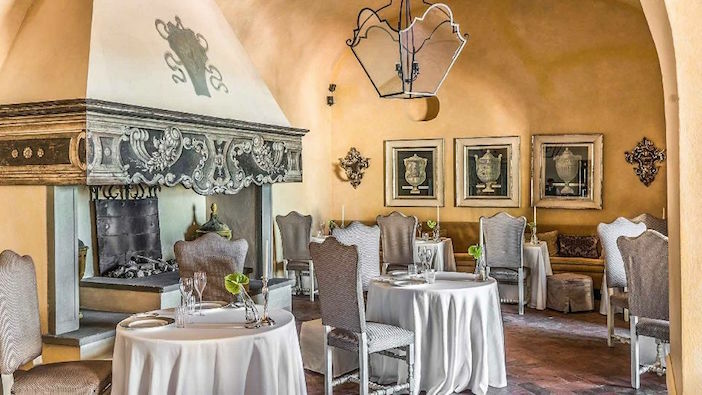 At Michelin-starred La Torre restaurant, that evening, we are privy to the finer elements of this, enjoying flavours rich with chestnut, porcini and other mushrooms, wild boar, and of course truffles – plus deliciously fresh scallops and other fish of the day. “If you want quality then you must follow nature,” so says chef. 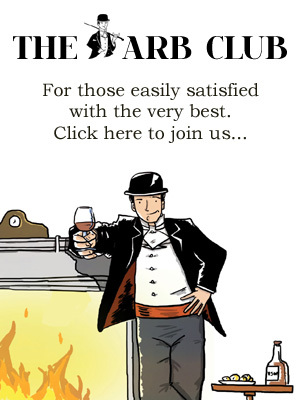 The hotel’s estate also makes its own wine and honey, and offers flighted tastings of both to guests in residence. The extensive 12th century wine cellar downstairs is a gift to be explored – and testament to the hotel receiving Wine Spectator magazine’s proudly displayed Award of Excellence consistently every year since 2013. The following morning, we take part in a culinary seminar, during which we learn how to make home-made pasta – ravioli and fettucine – using an authentic pasta machine and roller, as well as tiramisu – delicious, and, surprisingly easy. Both options are catered for according to our group’s various dietary requirements, with chef clearly enjoying passing on his own skills – and his own way of making ragù – using an unpeeled clove of garlic. Further cooler-month activities here include following one of the regional ‘percorsi’ (country walks) that start and finish at the hotel, as detailed in a handy leaflet given out at reception. Florence and Siena are both only half an hour away by car and the hotel puts on a free shuttle service to both for those arriving without a car. Fiat 500 and scooter hire is also possible for those wanting to tick off a piece of classic Italian stile di vita. The leather-clad, vaulted, open brick bar with its large open fireplace that was once the Castello’s kitchens, awaits your check-in for a cosy, comfortable stay. 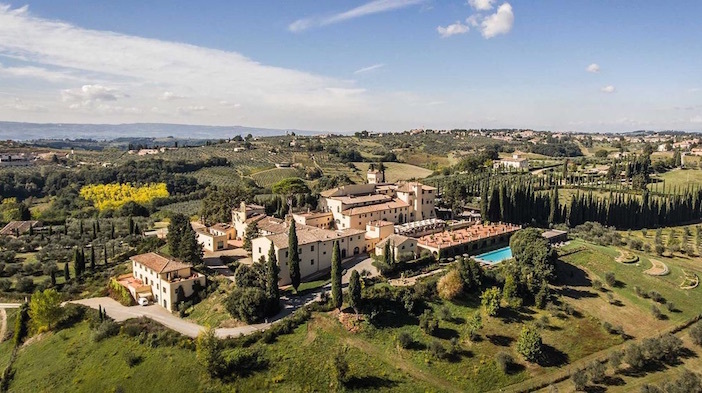 Castello del Nero is a member of the Leading Hotels of the World. For more information about the property, including details of events and offers, visit www.castellodelnero.com.